In 1950 there were fewer than one billion children (aged 0-14) in the world. By 2000 there were almost two billion. How many do UN experts think there will be in 2100? Option C, 2 billion children, is the correct answer. In 2100 there will be approximately 2 billion children in the world, according to estimates from the United Nations. That’s about the same number of children in the year 2000. The total number of children in the world is no longer increasing. We have reached “Peak Child”. 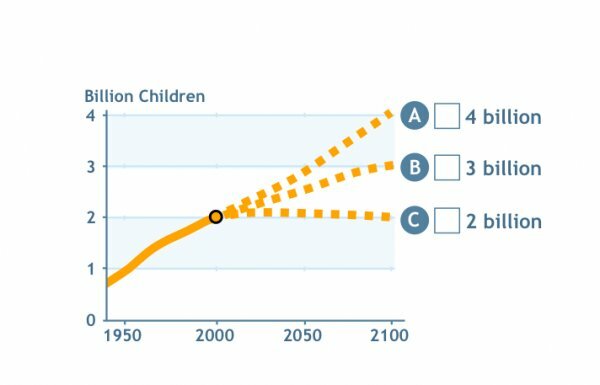 This slideshow shows the first Test Question from Gapminder Teach: How many children will there be in 2100? There are three alternatives for the public to choose from. The correct answer in show on the third slide. Use this test question in your presentation to test if people know the UN experts’ forecast of how many children there will be in 2100. It is extremely important to know this in order to understand why the world population is expected to stop growing during the second part of this century.